Pool Party Flyer Highly organized file Easy to edit Print Ready 4×6” with 0.25 bleeds CMYK 300 DPI Layerd PSD files Help file Fonts used: ..
Summer Beach Flyer The PSD file is very well organized in folders and layers. You can modify everything very easy and quick. Changing the color ..
Vintage Party Flyer. Flyer ideal to promote any events, parties, summer festivals and more. FEATURES PSD file – COLORS EASY TO CUSOMISE ..
Summer Flyer The PSD file is very well organized in folders and layers. You can modify everything very easy and quick. Changing the color ..
Tour Package is a WordPress Theme especially for travel company. 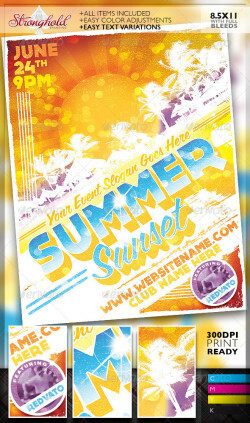 It comes with package post type which allow you to feature all packages ..
Summer Blast Flyer Template This Amazing advanced template designed to promote any summer beach parties FEATURS : The PSD file dimensions ..
Tiki Bar Party Flyer All TEXT IS Editable So you Can change the name if you like. easy All Elements included SUPER EASY !!!!! To Edit. Layered ..
Summer Club Beach Party Flyer. Photoshop (.PSD) Template. Easy to edit and ready to print. Color mode: CMYK Size: 15,4 × 21,6cm at 300dpi ..